Our awesome housesitter, “Ceci” arrived around 15:00 hours to receive final instructions on the care of our Casa and the critters that reside within it. We are so blessed that she is able to stay at our home and take care of the two dogs and three cats. Sophie, our eldest pooch, is now 10 and she is showing her age. I am very thankful to not have to board her out, as a Senior citizen! We arrived at Toronto International (YYZ) in good time (surprisingly very little traffic for a Friday evening) and we printed off our luggage tags at a Kiosk. We had previously checked in last night via the on line services. This expedited the process at the airport tremendously. There was a very short line for baggage drop off and within 10 (or less) minutes, we had checked in, luggage tags printed, and baggage dropped off. Security was a longer line, but it was flowing consistently and before we knew it, we were in the Departures Lounge, sipping on our Lattes from Starbucks. We are now waiting for the boarding call. We will be flying Premium Economy on board the Air Canada Dreamliner (789) to Frankfurt. A seven-and-a-half hour journey at which point we will switch over to a smaller Airbus (321) and fly one-hour to Venice. Boarded the Dreamliner (789) in very good fashion. As we were flying Premium Economy (PE) we were boarded right after Business Class, but before Regular Economy. There are 21 PE seats on the Air Canada 789 in a 2-3-2 configuration (3 rows total). We had seats 12H and 12K which is on the right side of the plane. The service was stellar on the Air Canada 7+ish hour flight to Frankfurt, we had a lovely stewardess who gave us the option between our pre-ordered vegetarian meal, OR the pasta entree (vegetarian) as most people in PE chose the chicken. Anthony and I both had the pasta (very good!) and then she came and offered us the original pre-ordered vegetarian meal if either of us were still hungry. How kind! Anthony took her up on the offer and he had a lentil dish (original) to finish off dinner. The plane had minor turbulence in a few spots (of course whenever I wanted to visit the loo, we had turbulence and I had to remain seated – LOL); but other than the minor bumps, a very smooth flight with plenty of leg room, wider seat, and a comfortable head rest. I watched “Jurassic World”, had a few glasses of wine, and then a light sleep on the plane until we were a couple of hours away from Frankfurt (FRA). As we arrived in FRA, I was a little concerned with the short turn-around from getting off our AC flight and finding the Lufthansa connecting flight. 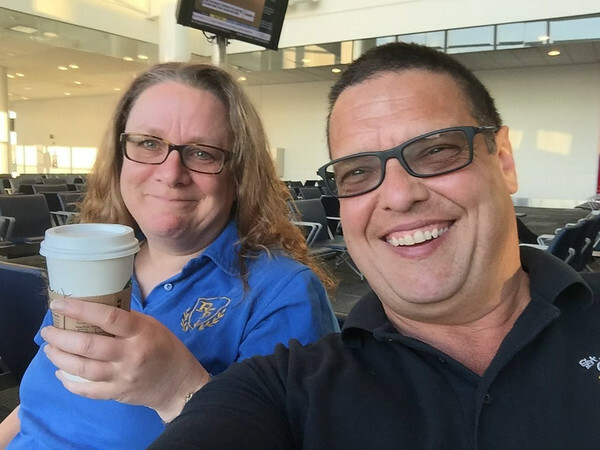 The only misstep in our AC experience was when I asked a Flight Attendant of the distance within the Terminal for the connecting flight and our time, she said not to worry, you will be there in 20 minutes or less, with time for a coffee! OH CONTRAIRE! what a nightmare it was. We had to go through a very long line in immigration (customs) as it was our first point of entry (POE) into Europe and then go through security (a very lengthy line) and now were were 20 minutes from our flight leaving. We were in a slight panic by now as the clock was against us. We literally RAN (booked it) through the terminal halls trying to get to our gate and we were not the only ones. There was about 8 people on our flight racing to Gate A52 to catch the flight to Venice. 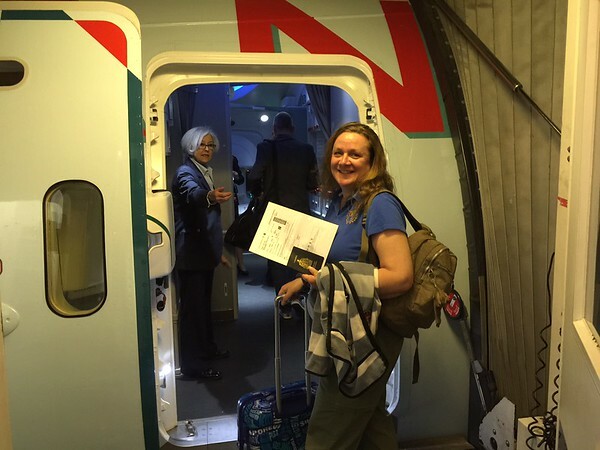 In the last leg (huffing, puffing and sweating profusely), I could hear the announcement, “Last call for Lufthansa 362 to Venice”, a shot of adrenaline pulsed through me and I pushed the boundaries and flew to the gate”. The attendant smiled and asked, “are you from the Air Canada flight”? and as I gasped for air, replied “Yes, and there is a group of people racing behind me”. “Not to worry”, she replied, “We are holding the bus for you”. THANK YOU Lufthansa! you rock!!! As I dragged my tired derriere down the corridor to the people mover bus, I began to realize, we made it! 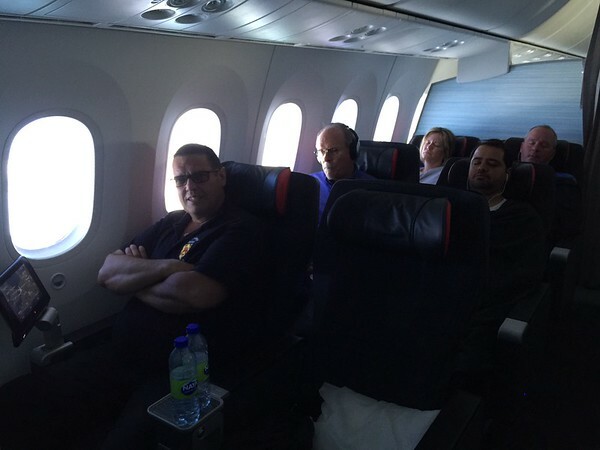 Lufthansa waited patiently for all of the Air Canada guests and did not leave anyone behind. Truly outstanding customer service! On board the Airbus 321 (3-3 configuration), we were seated in Row 14, just in front of the wing – Window and Aisle seat. A kind man in the outer aisle seat got up from his seat and assisted Anthony with our carry-on luggage. We then all sat, Anthony & I quite sweaty and flushed and the man looked over at our boarding passes and said, “Heather & Anthony”? I’m Joe and this is Sharon (looking over to his wife in the other outer aisle seat). We couldn’t believe it – they were from our cruise! they live in Florida and were connecting via Frankfurt as well. Joe & Sharon booked our previous Sky Suite (6100) when we left that suite for an upgrade. Small, small, world!!! 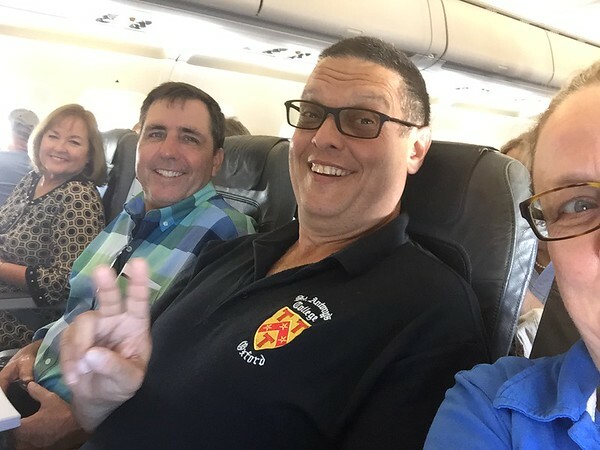 Joe & Sharon, Anthony & I chatted throughout the excellent flight from FRA-Venice (VCE). Very smooth flight and great service. Although only an one hour flight, we were served refreshments (drink and a snack). We surprisingly arrived in Venice on time and with a minor wait, retrieved all of our luggage (YAY! it all arrived). We entered the arrivals hall and our Shuttle Driver was patiently waiting for us with a clear sign with our names on it. He was very courteous, helpful, and understanding we were exhausted. He handled our luggage with care, had a very smooth drive from the Airport to our Hotel and arrived in very good fashion. 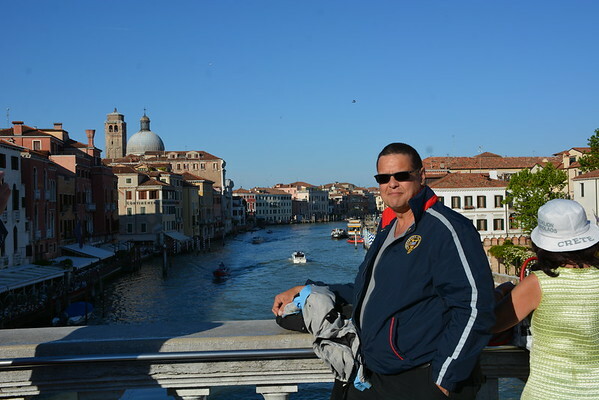 To stay or not to stay in the City of Venice, that was the question! 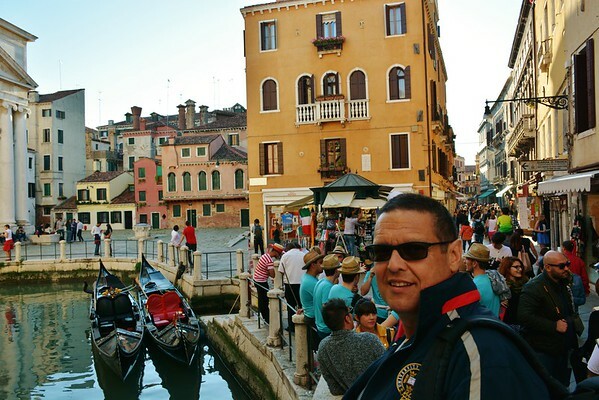 As first time travellers to Venice, we were conflicted whether to stay within the City of Venice OR on the mainland in Mestre. Although I had read many reviews (pros/cons of both), we finally decided to stay in Mestre because of extra activities we wanted to do, other than the city herself. Still not overly confident about our decision, we stuck to a plan and went for it. For our pre-cruise stay, we chose “Hotel Tritone” which is well reviewed on Trip Advisor, consistently at a rating of 4 and above. The most common comments were the friendly reception staff, cleanliness, buffet breakfast, reliable wi-fi, and the proximity to the train station. All of these comments materialized to be true throughout the booking process and the course of our stay. We initially reserved a room through booking.com but then when we went to the Tritone official web site found that they offered a 35% discount if you pre-paid (non-refundable) 14 days in advance. We chose this route and reconfirmed with the hotel that the “shuttle services” that we arranged with the hotel were still valid with the change in reservation. They immediately responded. I must say that the response rate of the Reception (Front Desk) staff was excellent pre-cruise and made us feel more comfortable with continuing on with our reservation. We had arranged with the hotel for a private car shuttle service from the Airport (Marco Polo) to the hotel. The cost was 40 Euros (much more expensive than the readily available bus and/or train), but after a long journey from Toronto – Frankfurt – Venice, we were relieved to find our driver patiently waiting for us in the arrivals hall with a clear sign that had our names on it. He was quite courteous and helpful from the time we met until the time he assisted with our luggage to the front desk of the hotel. No fuss, no muss, no regrets of paying the extra $ for his services. Check-in was a breeze, we had prepaid for the hotel, so a simple passport check and we received the keys to our room. We had booked a “Superior Double Room” which had been described as very roomy with a separate lounge area with table &amp; chair. The room was “OK” in size (slightly larger than a standard double room that you would find in Europe); but there was no “separate lounge area” that was mentioned on the web site. There was a mounted TV, bathrobe and slippers, coffee machine, and small desk/chair where I am sitting now, blogging this review. The room is a little tired looking (possibly from lots of traffic), but clean and no bugs (unwanted visitors). The bathroom has a separate tub and shower, with sink/toilet/bidet. The shower is excellent! very refreshing after such a long flight from Canada. On the morning of the 8th of May, we enjoyed the buffet breakfast (available from 07:00 – 10:30 am). Large selection of fruit, cereals, pastries, cheese, meats, and a few hot items. The front desk was very helpful on where to purchase train tickets to the city, provided us with a map that has Mestre on the one side and Venice on the opposite. Also gave us recommendations for dinner and printed off maps for us on how to get to them. The Hotel Tritone is rated as a 4-Star hotel. The rooms are questionable whether I would give them a 4-star (more like 3); but the service from the hotel staff is definitely 4-star in friendliness and helpfulness. Would I stay here again? I will report back on that. 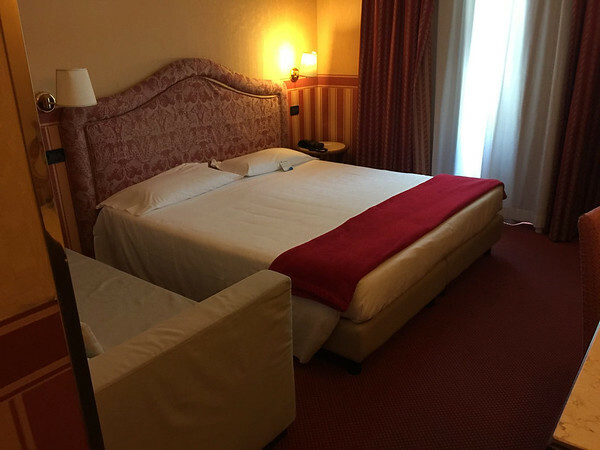 We have the Best Western Bologna (just a few metres away from the Tritone) booked as our post cruise hotel and I will definitely compare and contrast the two for which one we preferred. However, in a nutshell, this hotel was good and pleasant enough for our two-night pre-cruise stay in Veneto. 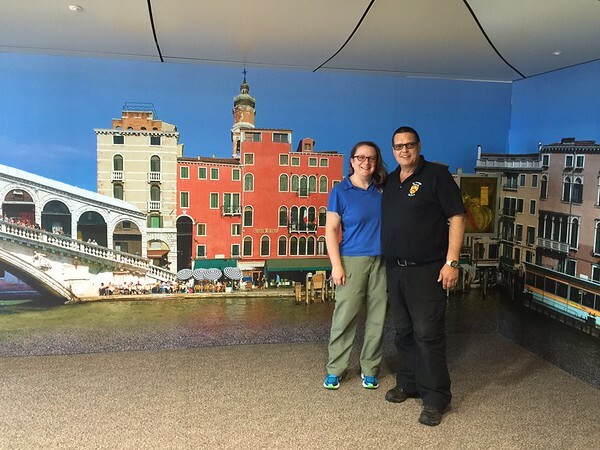 We asked the front desk reception staff the best way to get into Venice. He mentioned two options – the bus or the train. The bus takes about 20 minutes and the train around 10. We chose the train! The station is directly across the road from the Hotel Tritone, less than 5 minutes of walking. We were a little confused on how to purchase tickets and then to validate them. I had read previous transportation reviews that you *must* validate your train tickets after purchase and before boarding, lest you be liable for a 30 Euro fine on a 1.25 Euro ticket. It is not clearly communicated at the train station that validation is mandatory and there are not clear instructions on how to do it. I kept on bugging people at the train station until I was clear on all instructions 😉 An attendant at the train station was very helpful and guided us through one of the many available Kiosks that are located throughout the station. Once he explained how it was done, we realized how easy peasy it was! We had printed tickets in a very short time for both our journey to S. Lucia Train Station (Venice) and a pair of return tickets home. I asked the attendant about validation and he said at any of the “green machines” at the platforms. We went to our first platform where there were several machines, but found out that we were at the wrong platform, so moved along to the proper platform which had no green machines! now what? I saw an attendant at our proper train, asked her how to validate without any green machines around, and she told us not to worry – she will validate our tickets for us. So, she signed, dated, validated them and we were on our way! the train was clean and efficient. Only one stop along the way in Marghera. Within a very short time we crossed the bridge from the mainland to the island and we were in Venice. We exited the train, through the arrival halls and out onto a street. We were immediately taken aback with the Grand Canal before us. I had no words to describe the feelings and emotions that enveloped me. We were in Venice! At the recommendation of the reception staff from our Hotel, we decided to follow a clear route to the Rialto Bridge. 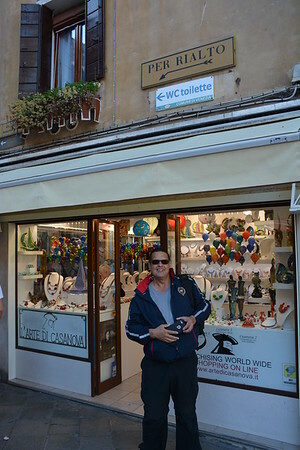 Even though there were sporadic signs showing you the direction to the Rialto and San Marco areas; they were unnecessary. It was very easy to follow the crowd and move with it. They were all going and/or coming from the same direction. The walk was very pleasant as we traversed over several bridges and some narrow streets. Lined with quaint shops, patisseries, pizzerias, and restaurants – we took in every moment of our walking adventure. We stopped and listened to a fantastic jazz quartet along the way, then stopped in for a slice of pizza and water further along the route. We watched people glide along in gondolas and watched water taxis take hundreds of tourists down the canals. Venice is absolutely one of the most beautiful cities that we have ever experienced, truly takes your breath away. 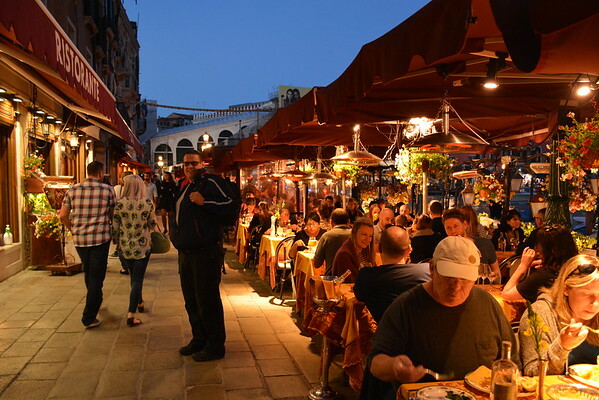 We finally reached the Rialto Bridge and decided to stay within the Rialto area for our first dinner in Venice. Although we most likely overpaid for the pasta dishes we ordered, it was well worth it as we sat outside along the banks of the Grand Canal. We had a delicious meal with location, location, location! After dinner, we were much too tired to walk back to the train station – after all, we had just arrived from Canada that afternoon! we were very pleased what we had accomplished thus far. We crossed over the Rialto Bridge and purchased two (2) vaparetto (water taxi) tickets to take us back to the train station. Each ticket was 7.50 Euros pp (15 Euros total). The water taxi was very crowded (tighter than a can of sardines) and a few moments of “hmmmm, if this boat tips, we’re all dead” came to mind. It was rather insane to state the least how they pack the masses on these water taxis. Anthony read a sign that the capacity was 210 passengers and I am sure we exceeded that limit. I could hardly breathe we were packed that tight! We chalked it down to experiencing Venice. We were so relieved when we saw the train station and the boat did tip a bit as 80% of the passengers disembarked at this stop. Returning back to Mestre, we had our pre-purchased train tickets in hand and all we had to do was have them validated and board the proper train. Validation was easy, green machines were all over the platforms. What “initially” wasn’t easy was identifying which train to take back to Mestre – but DUH! as we were informed by an Attendant – ALL trains that leave S.Lucia go through Mestre – just pick one! the train was standing room only (Saturday Night? ), but was again efficient and within 10 minutes we were back at our Hotel. Overall, using the train from Mestre to Venice to Mestre was very easy and uncomplicated once you knew what you were doing. 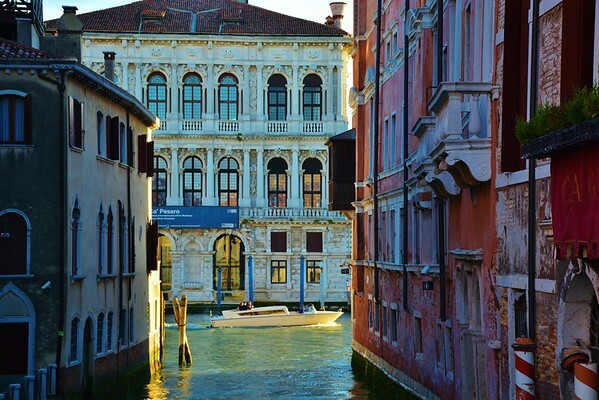 Considering the ease of getting into Venice, we wouldn’t hesitate again to stay in Mestre (vs. Venice City). Our target species for the day was the “Bee eater”, a migrant from South Africa that comes to Italy to breed and raise their chicks. Martina drove us to a park near our hotel where there is a known colony of 20-30 bee eaters. Within only a few minutes of parking the car, we heard the bee eaters and a small flock flew over our heads. We then proceeded down a lovely path in the park and Martina helped identify birds along the way. We then reached the key destination where there were several bee eaters soaring in the vicinity of the nest holes of the mud banks. 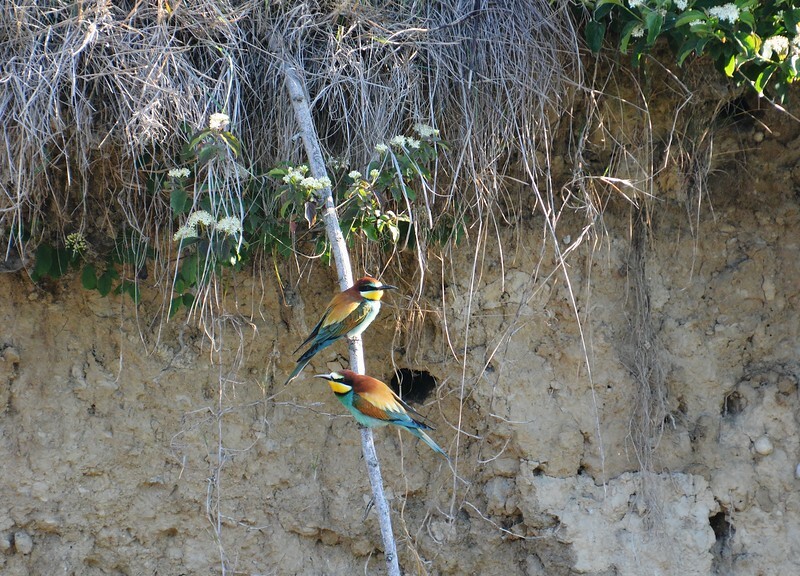 The bee eaters were breath-taking! We birded the area seeing some lovely species and were just having a grande time. Martina then asked us if we would be interested in a 20-minute drive for “maybe” a sighting of Flamingos in the southern Venice lagoon. As they were spotted the week before, there were no guarantees, and of course – as birders, we completely understood! We emphatically said YES! PLEASE! and off we went. 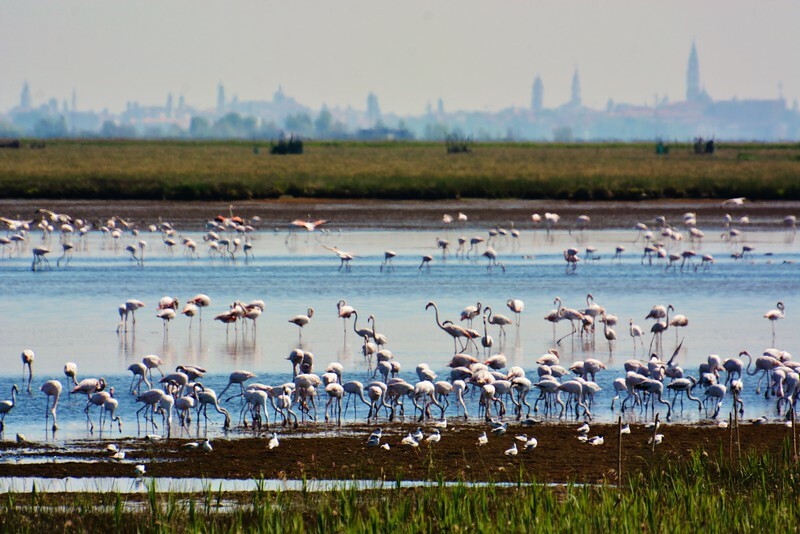 We reached Giare di Mira (Southern Venice Lagoon) in good time and initially could not see or hear any Flamingos. Then, Anthony looked through his scope and thought he saw some pink dots in the distance and Martina thought she heard the Flamingos. We decided to walk further and it was well worth the walk. We found not only a hundred Flamingos, but estimated to be about one thousand Flamingos! it was a stellar observation and we were so thankful for the amazing experience. After the Flamingos, we decided to head back to the Hotel. 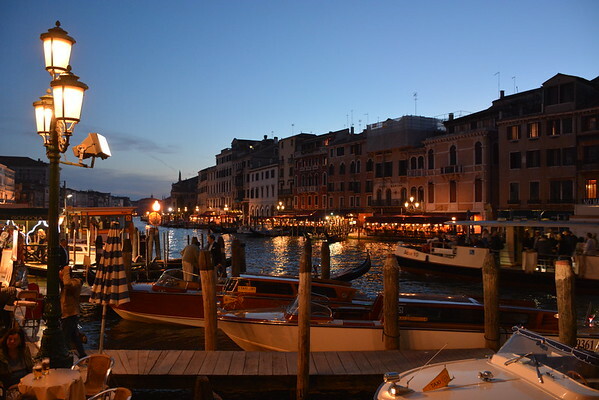 We decided not to go back into Venice that night, but instead prepare for our embarkation day. We found a little cafe around the corner from the hotel, “India Cafe” and enjoyed a personal pizza each before retiring for the night. If anyone is interested in birdwatching, nature tours, or photography tours, we would recommend “Amazing Nature Tours”.